Love your Lobster? 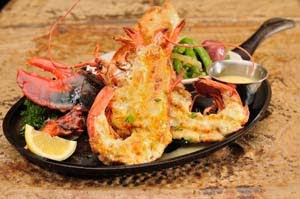 To celebrate National Seafood month, Pappadeaux Seafood Kitchen offers Lotsa Lobster, featuring six different delicious 1lb. live Maine lobster entrées beginning at 5 p.m. Oct 7. The entrées include: Laughing Lobster, steamed and finished with fresh ginger butter, served with stir fry canton noodles tossed with fresh mushrooms, peppers and Napa cabbage ($19.95); Stuffed Lobster, oven baked with crawfish stuffing served with fresh green beans and red potatoes ($19.95); Angry Lobster, steamed with a spicy chili sauce and served with zucchini ribbons ($19.95); Cheesy Lobster, oven-baked and topped with melted Parmesan cheese and served with fresh green beans and red potatoes ($19.95); N’Awlins Lobster, grilled and finished with creole spice and Orleans BBQ butter, served with fresh green beans and red potatoes ($19.95); and Lobste r in a Pot, lobster steamed in a personal pot with jumbo shrimp, corn, red potatoes, onions and Andouille sausage in a lobster broth ($22.95). All Lotsa Lobster entrées are served with tasty garlic bread and a dinner salad or Caesar salad can be added for an additional $2.95. If a Guest purchases one of the six lobster dishes, add an additional split lobster of the same type for $6.95. 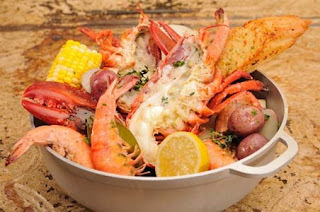 Pappadeaux also offers All-U-Can-Eat live Maine lobster every Wednesday after 5 p.m. while supplies last ($44.95). All-U-Can-Eat lobster is limited availability, price subject to change, and is for dine-in only. Get it while it lasts! Lotsa Lobster and All-U-Can-Eat Lobster are offered at both Chicago-area Pappadeaux locations (921 Pasquinelli Dr., Westmont; 798 W. Algonquin Rd., Arlington Heights). For more information on Pappadeaux Seafood Kitchen, to make reservations or to join the e-mail list, visit www.pappadeaux.com or call Westmont at (630) 455-9846 or Arlington Heights at (847) 228-9551.